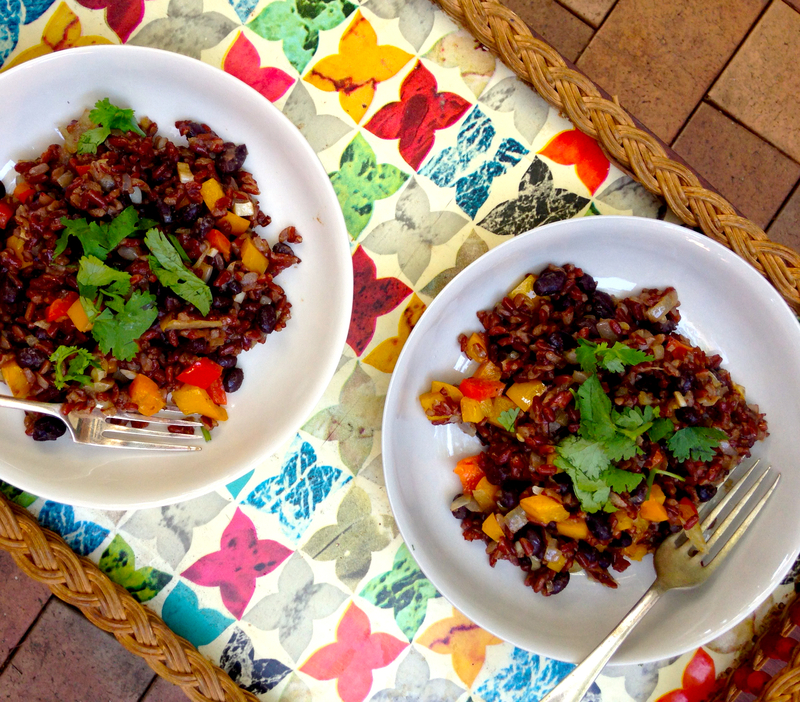 Gallo Pinto – rice and beans – is a one of the most well known dishes from Costa Rica. I’d never heard of it until a few months ago, when I was browsing through Jamie Oliver’s Super Food Everyday, where he showcased a 94-year-old Costa Rican man, who gave as one of the reasons for his longevity, a breakfast of Gallo Pinto with an egg everyday. Strangely, there was no recipe in the book for this dish but a quick Google searched turned up a plethora of recipes, making me wonder how come I’d never come across this deliciously simple vegetarian dish before. 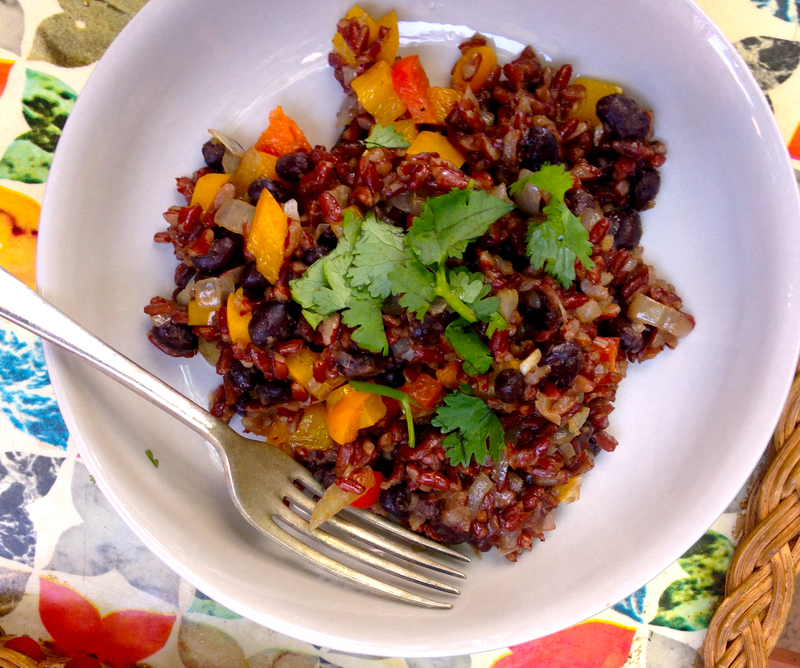 Gallo Pinto is traditionally made with white rice, which is cooled overnight (this is an important detail – if the rice isn’t properly cooled, your Gallo Pinto will be soggy). I’ve seen recipes which use brown rice but I feel that would make the Gallo Pinto too heavy. I’ve always loved the partially milled red rice of southern India but I’ve recently discovered unmilled red rice and become a convert to this wholegrain version. Red rice is slightly lighter than your average cooked brown rice but has similar nutritional benefits. The first time I cooked red rice, I made a huge pot and made variations of rice salad for lunch each day for nearly a week: I’m sure eating all that read rice had significant health benefits. I’ve used red rice a few time in Gallo Pinto and think I prefer the red rice version. I lighten the heavier red rice by adding some finely chopped red or yellow pepper to the original recipe. This is a bowl meal that comes together quickly and easily, brilliant for dinner or Sunday brunch. Just a note on the ingredient: Salsa Lizano, is a thin, liquid brown sauce used in cooking and as a condiment in Costa Rica, but it’s difficult, if not impossible, to find in Australia. Vegetarian Worcestershire sauce makes a good substitute – if you want even more authentic flavor, use half a teaspoon of liquid smoke along with the Worcestershire sauce. This is one of those great simple traditional vegetarian dishes, you can totally see how eating this for breakfast everyday would see you through to your nineties. Fresh coriander or sliced green onion to garnish. Saute onion, garlic and finely diced pepper, until onion is translucent. Add rice, beans, spices and Worcestershire sauce and toss until well combined and fragrant. Add a 1/4 to 1/2 a cup of bean liquid and season with salt and pepper. Season with salt and pepper, garnish with coriander and green onion if desired. I am costarican and instead of the Lizano sauce (that I can’t eat) I use habanero peppers.. when I saute the onion, garlic, pepper. It’s great for giving a scent and a little taste, it won’t be spicy unless you pinch the pepper.